Metorik includes a robust team system, allowing you to invite unlimited team members with a variety of different roles. Its best feature is probably that included with Metorik you can have unlimited team members at no extra cost. Admins can access the team member system by going to the store settings and then clicking the Manage Team tab in the left navigation, or by clicking this link. At the top of the team members page, you'll find an Invitations area, where you can send invites from. All you need to do is enter the email of the team member you'd like to invite, and optionally choose a role for them. Each role has different abilities, so be sure to choose the one that is appropriate for the given team member. Admins have complete control over a store and can do everything you can do, including adding team members to store, connecting integrations, and changing settings. They do not have access to the company & billing, and cannot delete the store or remove you from it. The Editor role can do everything you can in Metorik, except for editing store settings and adding team members. 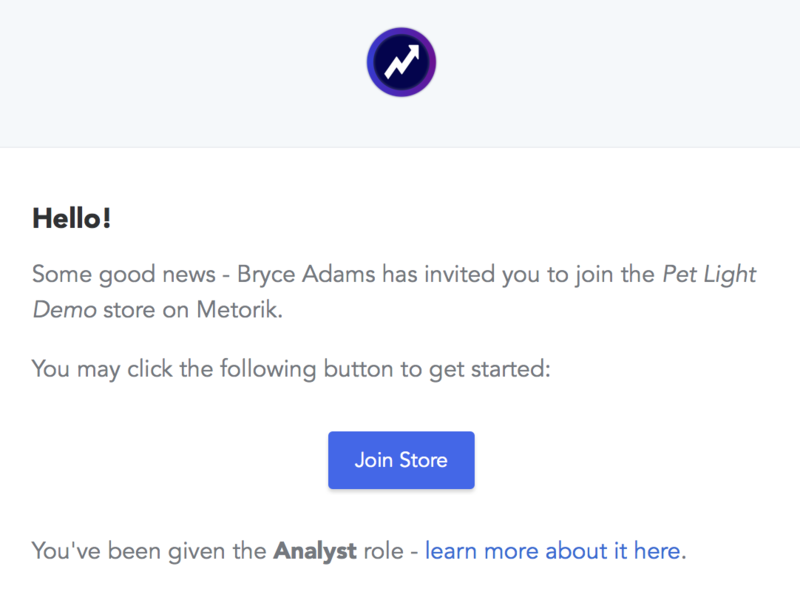 The Analyst role has access to all data in Metorik but can't edit any settings or resources. The Packer role only sees orders/customers in Metorik and can update them. The Packer (read only) role only sees orders/customers in Metorik and can't update them. After sending an invitation, the member will receive an email inviting them to join the team. If they already have a Metorik account, they'll be able to login and accept the invite from their personal settings page. If they don't already have a Metorik account, they'll be provided with a special link to create one and will then be added to the team. In the invitation email, they'll find a link to a help document detailing their role and the abilities it has.